My card is a standard A2 card and the papers used are Bazzill and Colorbok. I stamped out these four creepy images from my stamp set called "Happy Halloween" from Inkadinkado and colored them in using my prisma colored pencils. I mounted them on 1 1/4" squares that I cut out using my creative memories square punch. The images were then mounted on 1 1/2" black squares. I used one of my copics to outline the images in orange to make them pop off the black. I used my distressing tool to distress my layers to give it more of a spooky vibe. I love how it turned out! 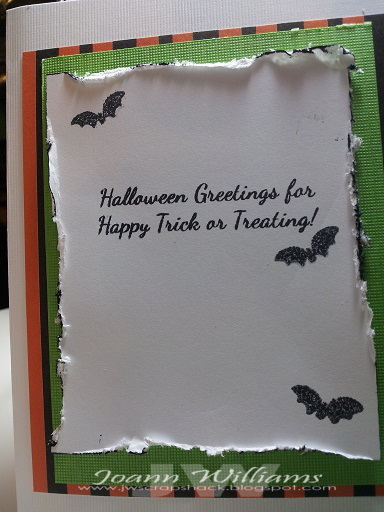 The inside sentiment is from the new Cardz TV Set Oct. 31st and the tiny bats are from the Inkadinkado set. I hope you stop on over to Just A Scrappin and link up your creation for this challenge and see what the wonderfully talented design team members created! 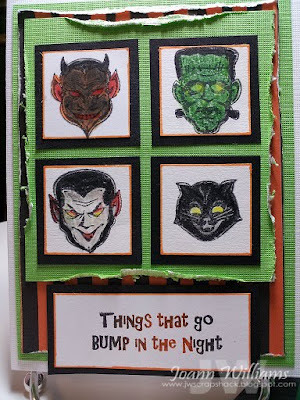 Great card-and great use of the card set! Love it! spooktacular! very cool halloween card, Jo! to answer your question. No, i almost never use my colorless blender for the lighter parts. when coloring, i always start at the darkest then mover on the lighter colors. and a lot of the time i only go over the lightest parts once or twice to keep them light with more contrast. i hope i am making sense here. =) hope this helps!